Industrial workplaces are prone to dust and contaminants, which increases the need for proper ventilation. Although small dust particles are always dismissed, various studies suggest that they may endanger the lives of workers who are exposed to it for long periods of time. Dust and fine contaminants may affect the respiratory system, as well as other body parts, thereby leading to severe health problems. To avoid all these issues, nowadays, dust collectors are used in industrial workplaces. Cyclone dust collectors are one of the popular types of dust collectors used at workplaces. Why are they popular? Do they offer certain advantages? Yes, there are many cyclone dust collector advantages, which make them popular over other types. This post will introduce you to cyclone dust collectors, and help you understand their beneficial features. These dust collectors are inspired from the cyclonic effect, and hence the name. Cyclonic dust collectors use the centrifugal effect to separate dust from the gas or air stream. 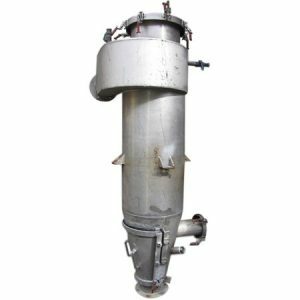 The collector is made of parts such as inlet, cone, body, outlet pipe, airlock, and discharge hopper. The gas enters the cyclone separator through the inlet, which is located at the top. Often it is seen that the gas stream enters in an involute or tangential manner depending on the design of the collector. It means, the gas stream or airflow will transition into a centrifugal vortex or downward spiral, once it enters into the inlet. Cyclone dust collectors are unlike the regular dust collectors, because they have two collection points for debris and dust, and thus are also known as two-stage dust collectors. The primary collection point is designed to filter debris and heavier chips, whereas the second collection point collects finer particles. The centrifugal vortex or downward spiral action pushes the larger particles towards the primary point, and smaller or finer particles towards the secondary point. The particles that are collected in the filter are also pushed to the secondary collection point. Requires No Expensive Filters: It is seen that most dust collectors utilize expensive filters, which need regular maintenance or replacements. However, cyclone dust collectors use centrifugal force to eliminate or remove particles from the airstream. Thus, these dust collectors are a brilliant choice for areas exposed to high levels of dust, contaminants, and airborne irritants. Safe Design: The two-stage dust collectors are considered safer than most other dust collectors. Why? It is often seen that a huge cloud of dust is released when the collection bag of a dust collector is cleaned. However, debris and heavier chips are released when the primary collection point of the cyclone dust collector is cleaned. Maintenance Free: Cleaning the filters or bag houses in industrial workplaces is not easy. These filters or bag houses are taken to isolated areas for cleaning. Most companies outsource this task to third-party contractors to ensure the process is smoothly performed. Also, the costs of filter replacements are high, which when added to the costs of third-party services may make a negative impact on the company’s budget. In this scenario, using a cyclone dust collector, which is low on maintenance, is an economical option. Recovery of Materials: In several industries, the dust collected in the dust collector may comprise gold or silver dust. This is reused or recycled, owing to its financial value. In such cases, using a standard filter is not recommendable because the material may get lost in filters, whereas cyclone dust collectors use no filters, and the collected valuable materials can be recovered through the discharge valve. The above-discussed cyclone dust collector advantages certainly contribute to their increasing use across industries. Are you planning to buy a new cyclone dust collector for your facility? It is not always necessary to invest in the new ones, rather you also opt for good-quality used cyclone dust collectors. J&M Industrial is one of the leading suppliers of unused and used cyclone dust collectors in the US. Cyclone Dust Collectors- What Makes Them So Popular?